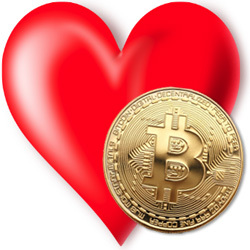 Valentines Day is all about love and your favourite cryptocurrency only casino, CryptoSlots.com has some special Valentines bonuses for you. From February 14 – 16, CryptoSlots is showing some Valentines love with cash top up bonuses up to $200 that can be claimed up to five times daily. CryptoSlots only uses Bitcoins, Bitcoin Cash and Litecoins for deposits and withdrawals and has 24 provably fair slots (7 of which are high limit versions), 9 video poker games and a one million-dollar jackpot game. (Jackpot Trigger is played with tokens collected while playing other games and can pay up to $1,000,000 on a single spin.) All games can be played on any computer, smartphone or tablet. CryptoSlots was created by pioneering online casino, Slotland, which also operates the unique WinADay Casino. Slotland players will find a free Valentine's spin in their inbox, with wins of up to $24, and Winaday will also be running Valentine's Day bonuses through to the weekend. CryptoSlots also recently introduced a monthly Crypto Lotto, tickets for which can be earned as you play other games. The top prize is a progressive amount of at least $10,000, second prize is $5,000, third prize is $1,000, and 17 further winners receive cash and Jackpot Tokens. One of the most popular games at CryptoSlots is the new Coin Rush, a 5x4 slot game with crypto coins spinning on its reels. Its extra row increases chances for a winning combination and scatters can trigger free spins. Before the bonus spins begin, there's a "pick" game where players choose a coin to determine the number of free spins they'll get – up to 99. The win multiplier increases -- up to 5X -- with each free spin win. "I love using crypto for casino deposits and withdrawals," said one regular player. "There's no credit card hassles and withdrawals are in my cryptocurrency wallet almost immediately – it's just as easy as using dollars!" Cryptocurrency has quickly become popular with online casino players since it's quick, easy and safe to use and transaction fees are lower than other options. At CryptoSlots, cryptocurrency deposits are immediately converted to US dollars for game play. Registration is also quick and easy since it requires only an email address (and a cryptocurrency wallet).